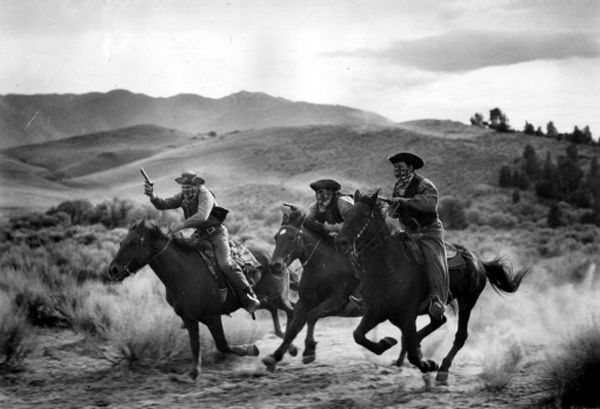 In the Wild West, where law was often non-existent, vigilantes often took “enforcement of the law,” as well as moral codes into their own hands. The term vigilante stems from the its Spanish equivalent, meaning private security agents. Vigilantes were most common in mining communities, but were also known to exist in cow towns and in farming settlements. Most often, these groups formed before any law and order existed in a new settlement. Justice included whipping and banishment from the town, but more often – offenders were lynched. Sometimes; however, vigilante groups formed in places where “authority” did exist, but where the “law” was deemed weak, intimidated by criminal elements, corrupt, or insufficient. Many times the vigilantes were seen as heroes and supported by the law-abiding citizens, seen as a necessary step to fill a much needed gap. Though this was usually the case, sometimes the vigilance committee began to wield too much power and became corrupt themselves. At other times, vigilantes were nothing more than ruthless mobs, attempting to take control away from authorities or masking themselves as “do-gooders” when their intents were little more than ruthless or they had criminal intent on their own minds. One of the first vigilante groups formed was the San Francisco Vigilantes of 1851. After several criminals were hanged the committee was disbanded. However, when the city administration, itself, became corrupt, a vigilante group formed once again in 1856. 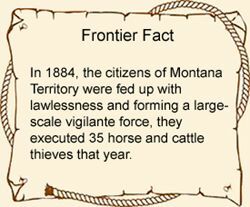 There were literally hundreds of these groups formed in the American West, such as the Montana Vigilantes who hanged Bannack Sheriff Henry Plummer in 1864. Controlling the press, the sheriff was made out to be the leader of an outlaw gang called the Innocents. However, history now questions if it wasn’t the vigilante group, themselves, who were behind the chaos reigning in Montana and that Henry Plummer was, in fact, an innocent man. Following the Civil War, the Reno Gang began to terrorize the Midwest, resulting in the formation of the Southern Indiana Vigilance Committee. The next time the Reno Gang attempted to rob a train, a the vigilante group lynched its leaders – Frank, William and Simeon Reno. Tales such as these abounded throughout the Old West, as numerous vigilantes attempted to tame the lawless frontier.